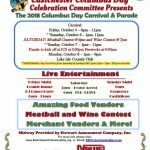 The 11th Annual Eastchester Columbus Day Carnival will take place over Columbus Day weekend, Friday, October 5th through Monday, October 8th, located at Lake Isle Country Club. The four day carnival features exciting rides for all ages by Stewart Amusements, delicious food and treats, live music and entertainment, games & prizes, vendors, homemade meatball and homemade wine competitions, and much more. Sunday afternoon is the 44th Annual Columbus Day Parade in Eastchester. The parade assembles at Immaculate Conception Church and steps off at 3:30pm. Sunday evening will feature a fireworks display at 8:30pm. Carnival ride wristbands are $30 each and will be available on Saturday and Sunday from 1-7pm each day. Individual ride tickets are $1.50 per ticket, $30 for 22 tickets, and $60 for 48 tickets. Entertainment at the festival includes a DJ dance party at 8pm on Friday; House Arrest at 3pm and FDR Drive at 6pm on Saturday; and Francesco Castiglione at 6pm on Sunday. 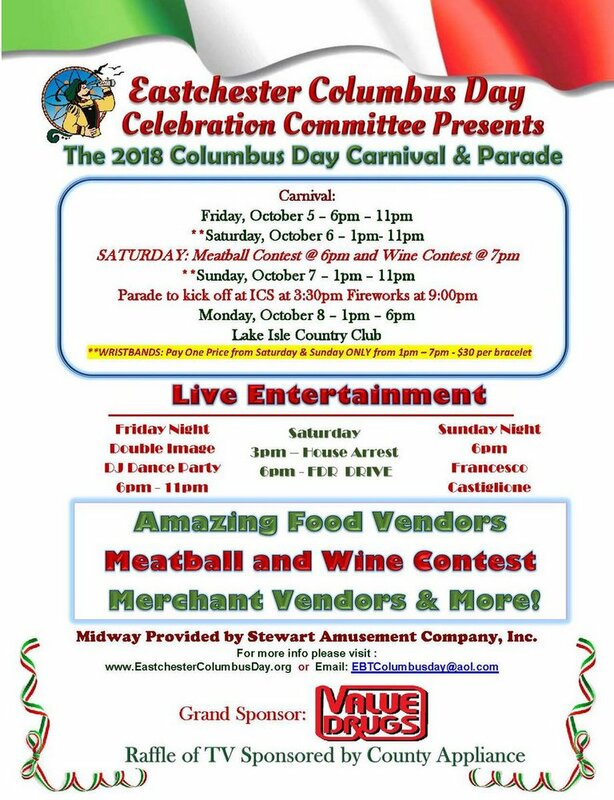 Food vendor, non-food vendor, sponsorship, and contest information and applications can be found on the homepage of the the Eastchester Columbus Day website.